Awakened Magicka fundamentally alters the way magic scales through the game, with an emphasis on Magicka as the means to increase power. 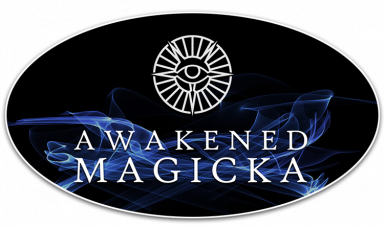 Thanks to revengeofbigd for creating the Awakened Magicka logo. Thanks to Gruftlord for Simple Magic Rebalance. The Enchanting/Alchemy changes in Awakened Magicka come directly from his mod. Used according to the permissions of that mod. Thanks to Eps01 for Mastered Magicka, which is the original inspiration for everything I’ve done here. The actual scripts and effects are entirely my own creation. Thanks to sushisquid for Better Magic. some of the changes in my Balance Tweaks patch are inspired by, or come directly from, his work. All changes are carried over according to the permissions of that mod. Thanks to jonwd7 for the original Brawl Bugs Patch. The NPC spell buffs would have been problematic without his fix. The scripts from his modder's resource were included in Awakened Magicka until version 3.0Beta. Thanks to Enaisiaion﻿ for the Modern Brawl Bug Patch﻿. The resources provided by them have been included starting in Awakened Magicka 3.0. Thanks to Dienes for his help creating the SkyProc patcher included in this mod, and for his continued development of this resource. Thanks also to ogerboss for his fix which allows the SkyProc library to continue to work with new releases of the USKP. Thanks to Nazenn for providing a FOMOD installer for the mod. Thanks to Dazzanator2 for offering an updated .esp with support for USLEEP in the months before I updated the project myself. Thanks to Kapiainen﻿ for Sublime Papyrus﻿. Not only did they create such an excellent tool, but they were very helpful about supporting it when I had problems. All of the scripts were written with the aid of this plugin. Removed SKSE dependency. Nearly all scripts have be rewritten/updated. Added USLEEP compatibility/dependency. No longer requires USKP. Added in-game configuration menus accessible by spell or at the statue of Shalidor in the mage's college. These are disabled by default if SKSE and SkyUI are present. Removed Chain Lightning safety feature because of certain circumstances that could cause enemies to not take damage (see bug reports for more info). Added options to update on level up and update on gaining perks. These are included to assist updating the buffs when SKSE is unavailable. Fixed a UI/description bug affecting all cloak spells. Multiple improvement and optimizations were added to all scripts. Removed old Brawl Bug Patch resource files, and added Modern Brawl Bug Patch. Reverted how the Unhindered Magic buffs keep track of mage helmets like the Dragon Priest Masks to a keyword based system. Updated .esp to most recent version. This should fix a bug where the NPC buffs menu in the MCM did not appear. Fixed an error preventing removal of spell power cap when using unbound linear scaling method. Fixed a bug that prevented changing the Scaling Factor and Cost Decrease Per Mastery Level settings in the MCM. Incorporated UDGP changes for DLC1ReanimateFFAimed25 magic effect (Vampire Lorde Reanimate effect). Added No Absorb/Reflect flag to Awakened Magicka spells. Also added Ignore Resistances flag to some of these spells. This should prevent NPCs from absorbing the effect, so that NPC buffs are applied correctly (and without the absorb visual effect). Removed ArmorHeavy/ArmorLight Keywords from Dragon Priest Masks and several other artifacts helmets (reinstates a previous change that had been reverted in version 2.0). Added an Elemental Weapons Patch (re-enables scaling of elemental enchantments on weapons, based on Augmented Element Perks). Fixed a few minor bugs in the MCM. Fixed a bug where Nonlinear and Tapered scaling curves were giving incorrectly scaled buffs. Packaged all options and patches in a new installer (provided by Nazenn). Added the option to apply spell scaling buffs to NPCs. The feature requires the use of a SkyProc patch, created by a patcher (compatible with the current version 2.1.3a of USKP) that is included in the download. Updated for changes in USKP up to version 2.1.3a, including removing changes to a few forms that were identical to the USKP. Added automatic compatibility with PERMA and SPERG. A separate patch or merge file is no longer required. Changed the way buffs are applied to the Player. The new method is quicker and more efficient. Added alternate spell scaling to a number of spells, including the Vampire Lord's Raise Dead ability. A patch is provided to let the new scaling to work when used together with Better Vampires. Moved the Chain-Lightning fix from the Balance Tweaks patch to the main file. Reverted changes to PerkSkillBoosts. There will no longer be any conflict with mods that make changes to this perk. However, any mod that changes AlchemySkillBoosts will need a compatibility patch. Reduced the duration of Paralyze and Mass Paralysis in the Balance Tweaks patch. Changed the method used by the Unhindered Magic spell cost reduction so that it recognizes Dragon Priest Masks and other artifacts without requiring changes to their forms. Consequently, most of these forms are no longer altered by Awakened Magicka, improving compatibility with other mods that alter these items. Removed changes to spell school Mastery Perks. These changes only altered the perk description to reflect the reduced spell costs provided by the mod. However, in order to improve compatibility, these forms are no longer changed by Awakened Magicka. Reverted Magicka regeneration rates, including those granted by the Recovery Perk, to their Vanilla values. Awakened Magicka is intended to INCREASE the importance of investing points in Magicka. Increasing the regeneration rates runs counter to this goal. If regeneration rates are seen to be too low, I may increase the values somewhat, possibly in the Balance Tweaks patch. The previous method of adding buffs to the player had a limitation that imposed a hard cap on spell scaling of 511.5% increased spell power. While not noticeable for the Nonlinear, Tapered, and Traditional Linear settings, this cap could be reached when the Unbounded Linear mode was selected. However, with the improved method of adding buffs to the player, the hard cap on the Unbounded Linear scaling method has been effectively removed. Fixed a bug where choosing to scale spell power off total Magicka actually applied buffs based on the current Magicka at the moment the buffs were applied, instead of the maximum Magicka. The new code correctly scales off of maximum Magicka, and properly accounts for all Magicka gained from enchantments, racial abilities, and any other sources. Added an option to update player buffs whenever an equipment change occurs. This is primarily intended for use when opting to scale off the players maximum Magicka, so that the buffs applied reflect Magicka gained from enchantments. The mod now uses the GMST settings for Magicka increase per level when calculating buff magnitudes. This setting can be changed to a custom value if using a mod that overrides the default behavior when leveling up. Changing this setting will not change the amount of Magicka gained per level; it is only used internally when applying buffs. Added an option to set a custom starting Magicka level for use when computing buff magnitudes. As with the Magicka increment, changing this setting will not change the player's starting Magicka pool; it is only used internally as a baseline for computing buff levels, and is useful when used in conjuction with any other mod that alter's the starting Magicka. Added support to save/load all MCM settings using JContainers, if it is installed. All scripts are now packaged in a .bsa. Added an option in the MCM to ignore Perk requirements when applying buffs. When selected, Buffs will always be the maximum possible value, with spell power buffs based solely on Magicka. Introducing Awakened Magicka, a new Magic Scaling Overhaul! Spell power now scales off base Magicka (inspired by Mastered Magicka). Fortify Spell School effects for Alchemy and Enchanting have been swapped (inspired by Simple Magic Rebalance). Spell costs are reduced further with Mastery Perks, particularly when not wearing armor. Taken together, these changes refocus spell power around a mage’s investment in Magicka. This elevates Magicka from a pointless stat, to a mage’s most important stat. Since mages can no longer enchant their way to zero spell costs, the most powerful spells can not be used casually, especially without a substantial investment in Magicka. But this investment is worthwhile for the dedicated mage, as it unlocks more raw power for all of their spells. But why should the Dragonborn be the only one to benefit from their focus on the arcane? Starting with version 2.0 of Awakened Magicka, NPCs can also receive spell power buffs based on their Magicka. The Dragonborn may become the most powerful mage in Skyrim, but their power will not go unrivaled! This mod requires USLEEP. SkyUI and SKSE are not required, although additional features are available if they are installed. 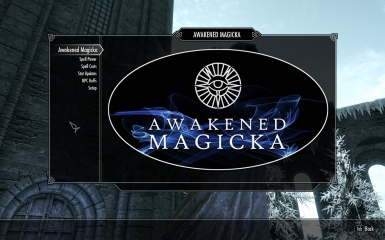 To Install, simply download Awakened Magicka and activate it with your preferred Mod Manager. Place Awakened Magicka near the top of your load order. NOTE: If you are updating from an earlier version of Awakened Magicka, you must follow the instructions posted near the top of the comments section. Before enabling the mod, load up any relevant save game and remove any clothing or other items from your character that have an enchantment that reduces spell costs. Also make certain that your character is not under the effect of a potion that increases spell damage. Make a new save, and then enable the mod. Reset the buffs after the mod is enabled by removing any clothing/items from your character with enchantments that affect spell power/cost, waiting for potions with similar effects to end, and then clicking the text labeled "Recalibrate Buffs" in the Setup section of the MCM. Note: These steps are only necessary when first installing the mod on a given save game. Of course, if you are starting a new game, you can simply install the mod and start your playthrough. If you plan on activating NPC buffs, you must create a SkyProc patch that adds the PerkSkillBoosts and AlchemySkillBoosts Perks to all NPCs. A SkyProc Patcher (compatible with USLEEP and USKP 2.1.3b) is included with Awakened Magicka and can be found in can be found in the Skyrim\Data\SkyProc Patchers\AwakenedMagickaNPCPerksFix folder. Patches created by ASIS with the NPC Enchant Fix enabled will also add these Perks to NPCs and can be used instead. Note that these patches must be recreated whenever you add (or remove) a mod to your load order which adds new NPCs to the game, if you want them to benefit from the spell power buffs. If you install the optional Balance Tweaks addon, make sure that it comes after Awakened Magicka in your load order. 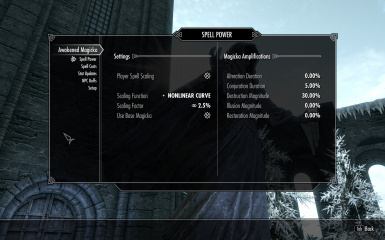 The core idea of this mod is that Magicka should be a mage’s most important stat. Investing points into Magicka represents a commitment to becoming a powerful spell caster. As a mage increases their Magicka pool, they are rewarded with increased spell power. For Destruction, Illusion, and Restoration, this is an increase in magnitude. For Alteration and Conjuration, this is an increase in duration. The inspiration for this method of spell scaling comes from Mastered Magicka by Eps01. Another, similar mod is Unrestricted Magicka by Drullo321. With Awakened Magicka, I’ve made improvements on the basic premise of these mods and added new features, as I’ll outline below. Spells in each school are now buffed based on how much base Magicka your character has, up to a cap determined by the highest Mastery Perk unlocked for the given spell school. 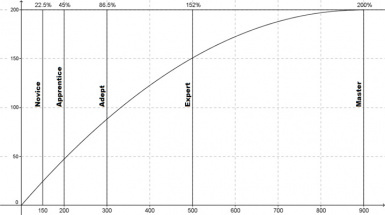 The following graph illustrates the default spell scaling, with lines to demark the caps for Novice, Apprentice, Adept, Expert, and Master Perks. Spell scaling is nonlinear, which means that power increases gradually at first, most dramatically at around 500 Magicka with the Expert Perk, and more gradually leading up to the maximum buff, which gives 200% greater spell power. I like this method of spell scaling best, because I feel like it is an immersive way to represent the small gains a new mage will make as she is just starting her studies, versus the large gains of a more experienced mage as she refines her skills, and the more gradual gains of a Master nearing the peak of her power. 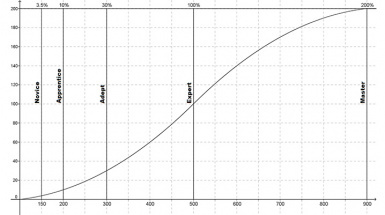 For those who prefer more rapid gains in power, there is another scaling method: Tapered Curve. Displayed in the graph below, this option gives massive gains in power at first, but tapers off as you near the Master level to give the max 200% increased spell power buff. Finally, for those who prefer a linear progression, there are also options in the MCM that provide that experience. With the first variant, Traditional Linear, your character gains a flat 2.5% spell power increase per 10 extra base Magicka up to a maximum 200% increase, with caps for each spell Mastery Perk that are similar to the default. The second variant, Unbounded Linear, is the same as Traditional Linear except that, once the Master Perk is unlocked, the power cap is effectively removed. This allows spell power to continue scaling far beyond the 200% cap. You can raise or lower the scaling factor. This will change how much extra spell power you gain when you increase your base Magicka. It will also adjust the caps for each Mastery Perk, and the maximum possible power increase. You can choose to scale off maximum Magicka instead of base Magicka. You can disable player spell scaling entirely. To solidify the importance of investing points in Magicka, I have incorporated most of Gruftlord’s changes from his mod, Simple Magic Rebalance. With these changes, you can no longer enchant away spell costs. This is accomplished by switching the Fortify Magic School effects for Enchanting and Alchemy. Another change that I carried over from Gruftlord’s mod prevents elemental enchantments on weapons from scaling with the Augmented Element Perks. I know that some people won’t like this change, but it just seems sensible to me. I let the Archmage’s Robes, Diadem of the Savant, and Necromancer’s Amulet retain their unique enchantments that reduce spell costs. I feel this is justified since these items cannot be disenchanted, and because I think it is useful to retain a few options in the game to reduce high spell costs. The downside of removing spell cost reductions from enchantments is that it makes it hard to manage high spell costs. The upside of the downside is that mages need to think tactically about the spells they cast, rather than spamming powerful spells. Still, spell costs can be difficult to manage, even with a large Magicka pool. To make things a little bit easier, I have incorporated my mod Unhindered Magic into Awakened Magicka. The basic premise is that spell costs are reduced for each part of the body not covered in armor. By default, your character will receive a spell cost reduction to all spells in all schools based on the highest Mastery Perk unlocked in any spell school, and on how many clothing slots aren’t equipped with armor. This is set to 1% cost reduction per Mastery level per slot unarmored. Additional options are available in the MCM, including the option to disable this effect entirely. NPCs can now benefit from increases in Spell Power, such as those gained from enchantments. In addition, NPCs can receive the same spell power buffs as the player, based on their base Magicka. This feature is disabled by default, but can be enabled in the MCM by entering the NPC Buffs section and changing NPC Buffs Mode to Apply Buffs. The MCM contains a number of configuration options related to these buffs and how they are applied. I’ve added a number of additional features to the mod, intended to enhance the player’s experience with this type of spell scaling. Dead Thrall effects higher level targets. Banish/Expel/Command Daedra affect higher level Daedra. These and other spells benefit from the alternate spell scaling methods, allowing them to remain useful throughout the game. All wall spells now correctly display the damage done to enemies passing through them. This damage scales with spell power. All cloak spells, including Stendarr’s Aura, accurately display the amount of damage done to nearby enemies. Cloak spells increase in duration and damage as spell power increases. Dual casting cost multiplier has been decreased to 2.5 from 2.8. Dual casting power multiplier has been increased to 2.3 from 2.2. All Ritual Spells can now be Dual Cast. Impact changed to have a 33% chance of stagger. Duration of paralysis reduced to 5 seconds, and mass paralysis reduced to 7 seconds. The duration will increase with spell power. Cloak spells have their base duration dropped to 30 seconds. Augmented Element damage is reduced to a 10%/20% increase. This seems like a significant nerf to the Perk, but I feel like it is necessary with the overall increase in spell power. Also it’s not quite as severe as it may at first seem: with 280 Magicka and the appropriate Augmented Element and Destruction Mastery Perks, your elemental destruction spells will do 1.5 times their base damage, or the same amount that they would have in Vanilla Skyrim. Augmented Element Perks now give Elemental Affinity Buffs: 10%/20% resistance to the element of the Perk. This change is to help make the Perk feel more attractive given the above nerf. Corrected enchantment of lowest level Heavy Miraak Mask to match the lowest level Light Miraak Mask (I consider this a bugfix). Call To Arms gives a confidence boost, like other lower level spells. Ritual Destruction Spells have a very light stagger effect added. I’ve paid careful attention to reducing and even eliminating script lag. With the default settings, there should be absolutely no script lag. The buffs are set to update only when the player exits the Perk trees, rather than continuously. Since this is normally the only way to gain Mastery Perks or increase your Base Magicka, this will work for most people. However, some people may gain stats without ever entering this screen, perhaps through a mod or by using the console. If this is the case, the mod can be configured through the MCM to look for stat changes on a regular interval, and update the buffs when changes occur. Since checking for changes is generally a very quick, low impact process, players should not notice any lag when this option is selected (but may notice some if they are running a lot of scripts, and particularly if script lag was already a problem). Whatever update method you choose, buffs to spell power and cost will not update until several seconds after your stats change, and will not update while you are in most menus. Don’t put points into Magicka, exit the skill tree, and immediately look at your spell list expecting to see a change. On average, the buffs should update within a few seconds. NPC buffs do require more work to apply than the equivalent player buffs. Awakened Magicka uses an invisible cloak effect, similar to what is done in other mods, to apply buffs to NPCs. This procedure has been optimized to be as efficient and stable as possible. However, when enabled, this feature will add additional strain to the papyrus scripting engine and, on systems with a heavy script load, may cause some script lag. Therefore, the feature is disabled by default. Note, however, that there are a number of configuration options in the MCM that can be changed in order to improve performance when NPC buffs are enabled. In general, I expect that most users can enable this feature without any fear of performance issues. I’ve designed this mod to be as compatible as possible. Aside from the changes carried over from Simple Magic Rebalance, very few Vanilla forms have been altered. Mods that add new spells should be compatible, and the new spells should scale in general. However, if the spells are heavily scripted they may not scale as desired. Ordinator is automatically compatibile without needing a patch. I've smoothed out spell scaling to work with only two Mastery Perks per spell school, instead of the five Perks in Vanilla. Perma is automatically compatible without requiring a patch. Spell scaling and cost reductions work as intended. Use the Lite version of the mod or load Perma after Awakened Magicka if you prefer Perma's changes to Fortify Spell School Enchantments. SkyRe is compatible, although there are a few conflicting changes. A patch is provided to account for any conflicts. I do not recommend using the optional balance tweaks when using SkyRe. SPERG is automatically compatible without requiring a patch. Any other game overhaul that retains the school Mastery Perks (Novice, Apprentice, Adept, Expert, Master), even if the Perks are altered, should generally be compatible. For the more obscure Perk mods, there is an option in the MCM to ignore the normal Perk requirements when applying the buffs. Under this option, the maximum possible buffs will be given, with spell power scaling exclusively based on Magicka. Magic overhauls should be mostly compatible. However, since most overhauls include some form of spell scaling of their own, using them together with Awakened Magicka may lead to a situation where all spells become ridiculously overpowered. In general, I would recommend only using one form of spell scaling. Mods that change the Dragon Priest masks should be loaded after Awakened Magicka, or they will be overridden. Patches are available for Lore-Friendly Artifact Rebalance and Better Vampires to allow full compatibility with these mods. I have offered several versions of the mod: a version for Vanilla Skyrim, a full version with Dawnguard/Dragonborn support, and a lite version both, with and without DLC support, that does not include the Simple Magic Rebalance changes to Enchanting/Alchemy. To further improve Conjuration I recommend installing Bound Armory and Atronach Scaling. Thank you for your interest in my mods, and for giving Awakened Magicka a try! I hope that my work finds a place in your adventures in Skyrim. Let me know what you think, and leave any suggestions you may have in the comments. Thanks to Gruftlord for Simple Magic Rebalance. The Enchanting/Alchemy changes in Awakened Magicka come directly from his mod. Thanks to Eps01 for Mastered Magicka, which is the original inspiration for everything I’ve done here. Thanks to sushisquid for Better Magic. Some of the changes in my Balance Tweaks patch are inspired by, or come directly from, his work. Thanks to Enaisiaion for the Modern Brawl Bug Patch. The resources provided by them have been included starting in Awakened Magicka 3.0. Thanks to Kapiainen for Sublime Papyrus. Not only did they create such an excellent tool, but they were very helpful about supporting it when I had problems. All of the scripts were written with the aid of this plugin.